By Mary Jaffe, WRAP Business Manager, Advocates for Human Potential, Inc.
Drumroll, please! After weeks of previews and months of hard work, I’m delighted to reveal the new WRAP visual identity and our first new book release. Meet the new WRAP logo. This logo combines the key colors of the WRAP family of books, along with a visual depiction of the five key concepts. It represents the growth, movement, and power of WRAP. You’ll see this color combination and logo on all our new and updated products, as well as on our website, Facebook page, and email newsletter. We’ll also be revising the facilitator slides with this new look. We’ll let you know as soon as the new slides are ready and how to get them! Wellness Recovery Action Plan, also known as the Red Book, was the first WRAP book ever released. It’s the foundation for all the other WRAP materials, so it seemed only fitting to make it the first book we update. A revised introduction. 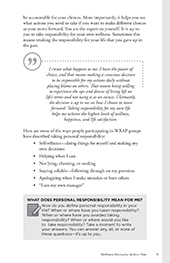 This has been rewritten to include important information on how people can use WRAP to create and maintain wellness in their lives in a variety of circumstances and settings. 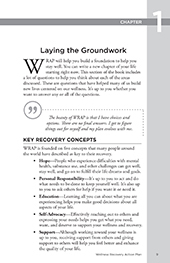 A “groundwork” chapter introduces the key recovery concepts, WRAP values and ethics, and valuable thinking/writing prompts. The new final chapter will help you build a wellness lifestyle and think about next steps. Wellness toolbox changes. There are now new examples and prompts to help you identify personal wellness tools. Daily plan revisions. The “daily maintenance plan” is now called a “daily plan.” Our goal with the plan is to maintain wellness, but a daily plan can be about more than just maintaining; it can include new habits, ideas, or goals that help you stretch, grow, and thrive—not just maintain. This section has new examples and prompts. Language changes. To be more trauma informed, we removed words such as “symptoms,” “diagnoses,” and “triggers.” This was done to ensure the WRAP values and ethics clearly shine through. As an example, many people view the term “triggers” as violent, and it can bring up uncomfortable imagery. The trauma community has been moving away from that word for many years and to honor this shift, we’ll be replacing the term “triggers” with “stressors” in our printed materials. Stressors revisions. There are new examples and prompts to think about stressors, how to respond to them, and ways to limit exposure to stressors that are avoidable. Enhancements to sections on warning signs and signs that things are breaking down. The chapters focusing on early warning signs and signs that things are breaking down have new examples and prompts. The text also now prompts people to think about opportunities to update their WRAP after a breakdown to better support their wellness moving forward. Crisis plan expansion. The crisis and post-crisis plans now include more thought prompts and flexibility to help you design a plan for any type of crisis you may encounter—not just a mental health crisis. New appendices. Many of the appendices in previous editions of the Red Book contained information and examples that were hard to keep up-to-date in printed format. Those chapters have been retired and replaced with new appendices about peer support and shared decision-making—information that won’t become outdated quickly. Some previous appendix information has been woven into the text, and other information will be updated regularly on the WRAP website. 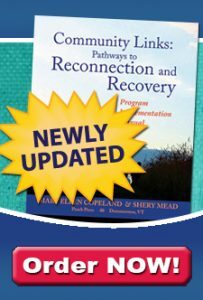 The new edition of Wellness Recovery Action Plan is now available for presale through the WRAP bookstore. You can still order copies of the previous edition while supplies last. We will also maintain translations of the previous edition until the new edition is translated, so non-English–speaking WRAPpers don’t need to worry—we have you covered. Now that you’ve gotten an insider’s look at some of the enhancements, which ones are you most excited about? Visit our Facebook page and leave a comment about your favorite updates to the new Red Book!